Smash the living daylights out of the living dead with our guide. 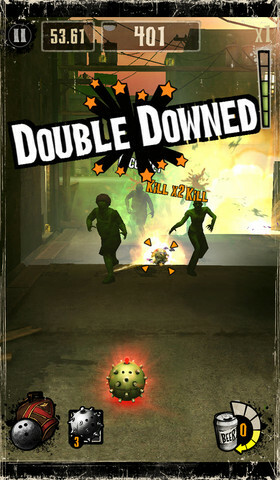 If you like your games a little off the wall, you should probably look into Activision's new mobile game The Bowling Dead. We reviewed the game earlier today, and had much praise for the eccentric gameplay that combines the fine art of bowling with the destruction of a thoroughly disagreeable zombie invasion force. If you're struggling to get to grips with the game, our comprehensive gameplay guide will have you landing killer shots in no time. How does the melee combat in The Bowling Dead work? If you don't manage to take out a zombie before it gets close to you, you'll have to enter a one-on-one melee fight with the shambling creature. As soon as you see arrows appear on its body, swipe in the direction of the arrows as quickly as possible. He'll fight back, and take some of your health off in the process, so clear the arrows as soon as they appear. How should I deal with large groups of zombies in The Bowling Dead? The sooner you unlock the giant ball in the game the better, as you'll soon have to deal with extremely large packs of invaders. Keep this upgraded ball in reserve, and use it for only the densest of zombie packs. I've run out of $MASH in The Bowling Dead. How can I get more? The fastest way to replenish your $MASH is to take part in the Survival mode of the game. Not only will you receive an extra chunk of $MASH, but the longer you can survive here, the higher the multiplier you'll be rewarded with. What do the glowing beer cans do in The Bowling Dead? Every now and then you will see a sparkling gold beer can in the alley. Tap on these as soon as possible as they'll reward you with either extra bowling balls, or extra $MASH. How do I lob, rather than roll, a bowling ball in The Bowling Dead? If you don't want to roll the ball towards your enemies, you can lob it at them as a precision shot. Don't pull back on the ball, instead just hold your finger down and then flick it at the enemy. Try and get a head-shot if you want to deal some serious damage to your opponent. How can I carry more bowling balls in The Bowling Dead? If you find yourself running out of bowling balls, consider investing in the Carry Capacity upgrade that's found in the game store. You can find it in the section marked with a bowling ball icon. How should I deal with multiple zombie packs in The Bowling Dead? If you find yourself under heavy assault from zombies across two directions, make use of your disco, chainsaw and proximity bowling balls. Using these balls will make life much easier, and hold the pack off just long enough to deal with the threat. Why is my new bowling ball useless in The Bowling Dead? Some of the new ball types you can purchase in the game require significant upgrades before their real power becomes obvious. There are no turkeys when it comes to the different ball types, but you may need to invest deeply to get the most out of them. 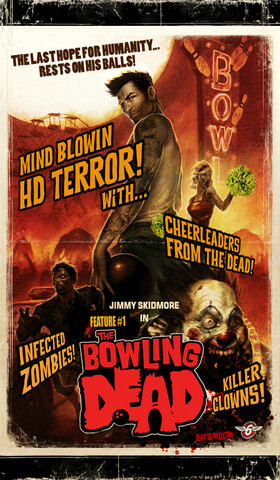 How do the cheerleader zombies work in The Bowling Dead? 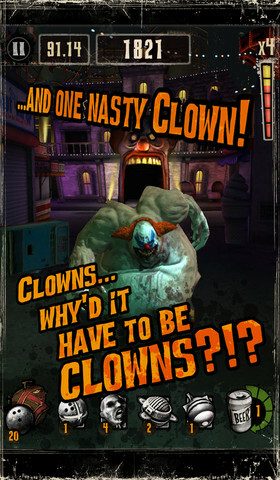 If you've found yourself in a hopeless struggle, it's probably because a cheerleader zombie was left to wreak its havoc! A cheerleader zombie will enhance the damage output of every other zombie within its proximity, so you must prioritize killing it as soon as possible. Get 'em with a well-lobbed headshot! How does the focus bar work in The Bowling Dead? Every time you successfully take down a zombie, your focus meter on the right-hand side of the screen increases. The focus meter adds a bonus to your points-scoring, but be aware that the moment you miss a shot, the meter will be reset.